Designed for marine applications, our VRCS takes into consideration all the challenges faced by ship operators worldwide. Engineered for reliability. The cabinets allow for redundant power supply and redundant communication lines to the automation system. Two VolOil sensors are installed per each valve, increasing the precision of the position feedback reading. 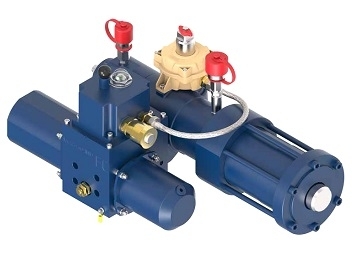 Internal leakage of hydraulic components has been reduced to a minimum, minimizing the loss of hydraulic pressure. A solution called RPC (Reduce Pressure Consumption) has been developed to further reduce leakage on the solenoid valves when there are no commands to the actuators. This results in reducing the HPU’s number of motor starts, thus increasing the lifetime of the system, and as a result achieving lower maintenance costs. Purposely designed for valve applications – providing critical information such as pipe leakage detection alarms, valve obstruction, change in operating conditions. The high reliability of our Voloil sensor, in combination with our dedicated valve controllers, makes our system extremely useful not only for submerged valves but even in case of valves installed in Hazardous area Zone 1 or 0, where the use of traditional indirect position feedback methods are not reliable, and the cost of explosion-proof devices is excessively high. The system is interfaced with the automation by redundant bus communication, while an additional hard-wired interface is also available for each valve to be controlled by a mimic or a security system. Download the Masso VRCS brochure for further details.